We perform a variety of programmes, tailored to suit our a udiences. We can also run workshop sessions, lasting half a day, whole day, or longer! We cater for all ages, from nursery school children right up to their great-grannies and grandpas. A short demonstration, or a whole evening's entertainment - our performance can be as long or as short as you wish, with plenty of audience participation. As well as "set piece" performances, at longer events we do what we call "background waulking", when we waulk fairly constantly, stopping to chat to passers-by, encouraging them to join us at the table. This works well in all-day events. It's educational ... It's fun! Some of our programmes are illustrated with PowerPoint slides. 3. Feuds, Fights ... and Fairies! Songs and stories from Highland history. Hear about ancient clan battles and dark deeds...fairies ... Jacobites ... culminating in Trod nan Cailleach (The Old Wives' Quarrel), the re-enactment of a poetical name-calling contest across the waulking board - with fatal results! (Not for those of a nervous disposition! We sing some of Marjory Kennedy-Fraser's well-known Songs of the Hebrides, comparing them with original traditional versions. A talk - with songs and slides - on the ancient crafts of spinning and dyeing. Songs and stories, in Gaelic or English, specially for the children. 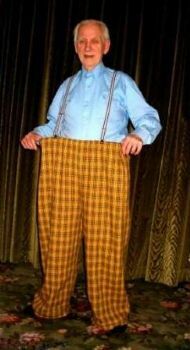 Donald's new trousers / A' bhriogais ùr aig Dòmhnall.